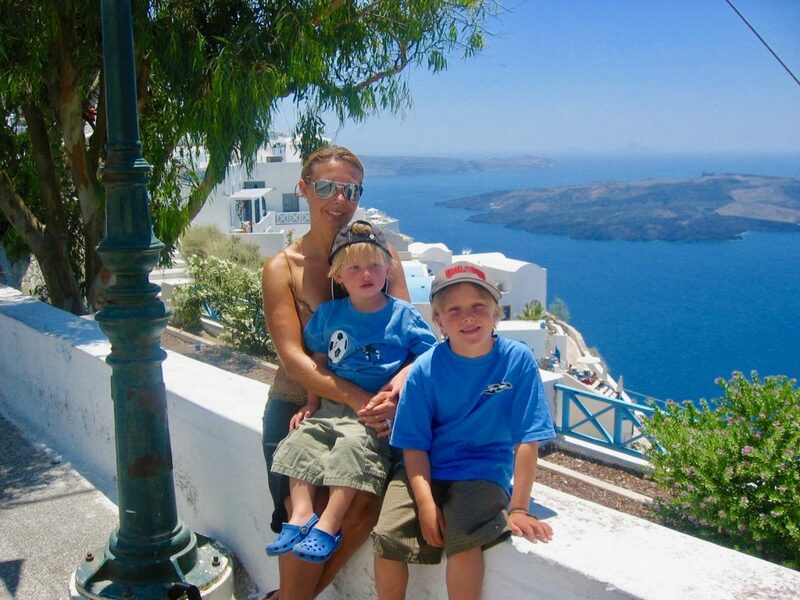 Our travels have taken us many gorgeous places, but the Greek island of Santorini – with skies and oceans so blue it dazzles the eyes – was simply magical. 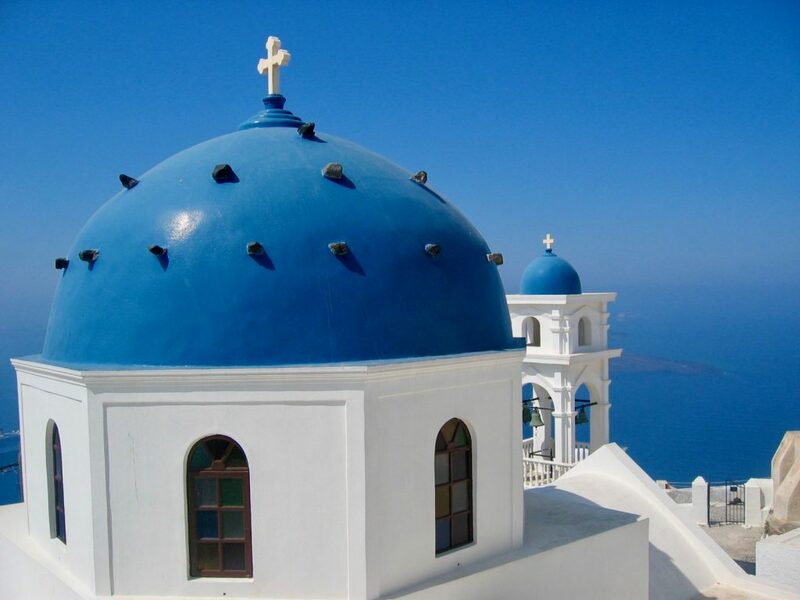 Santorini is probably the most instantly recognizable Greek island, with dramatic cliffs, jaw-dropping blue domed buildings and pristine whitewashed buildings. 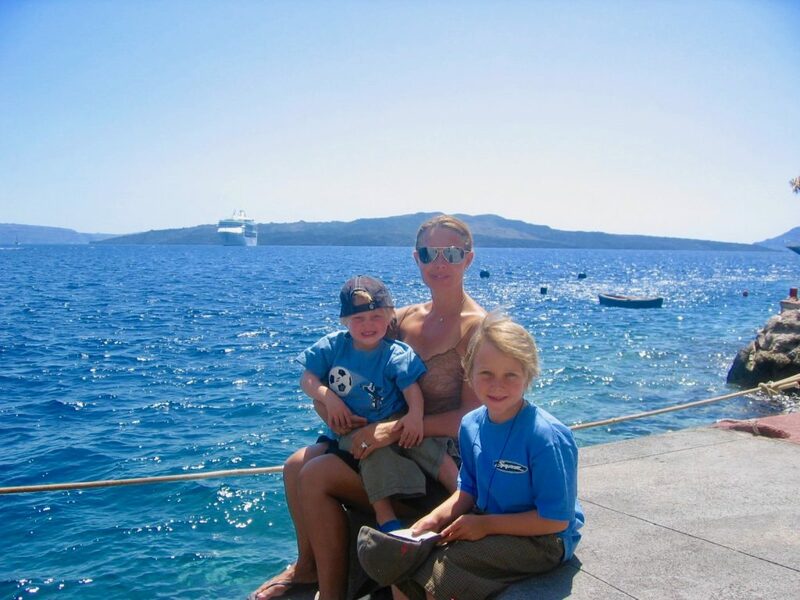 The fantastic food, stunning panoramic views, romantic sunsets and beautiful beaches, made it a truly incredible place to visit. 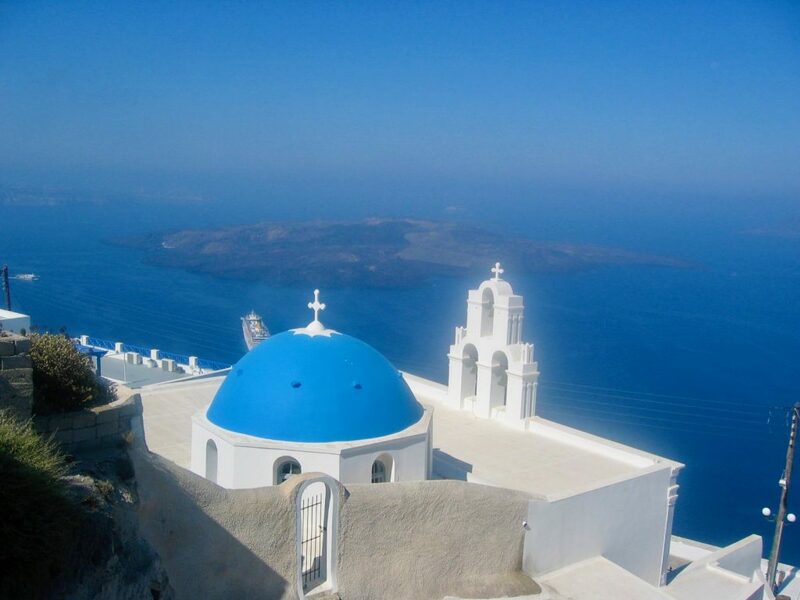 There are many reasons to move Santorini to the top of your travel list; here are eight to get started! 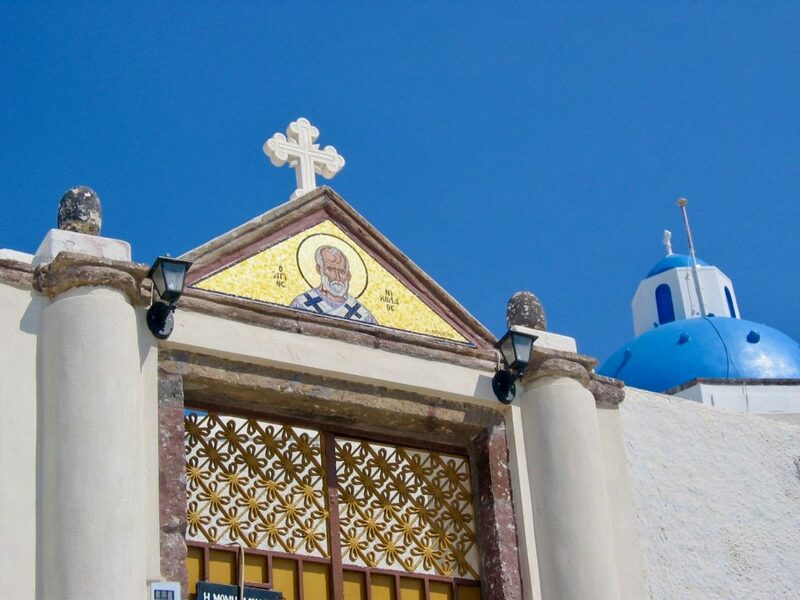 The iconic blue domed churches perfectly match the blue sky and the backdrop of the Aegean Sea. These can be found all over the island. 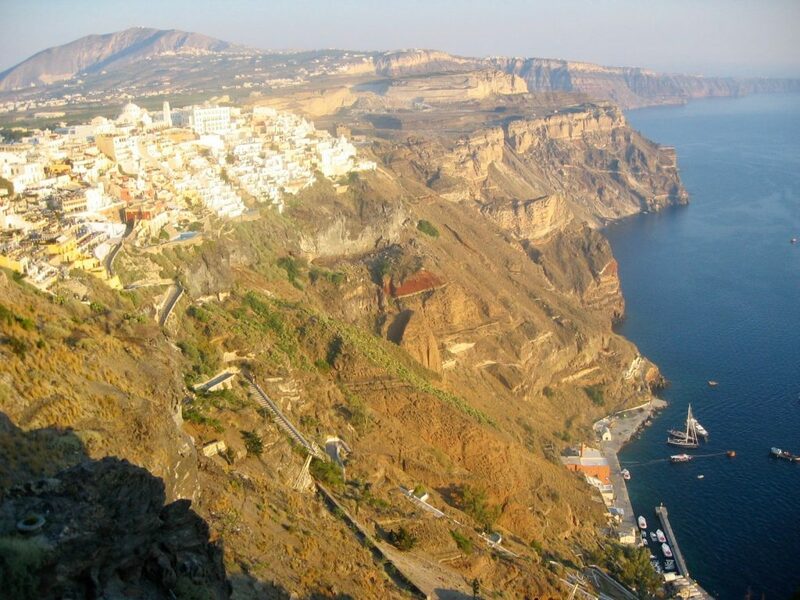 This is without a doubt the image of an idyllic Greek holiday, mentally transporting you to sipping crisp white wine and eating fresh fish, at a local restaurant built into the cliff. The domes are a visual delight, and it didn’t get old stopping to linger at the beauty. 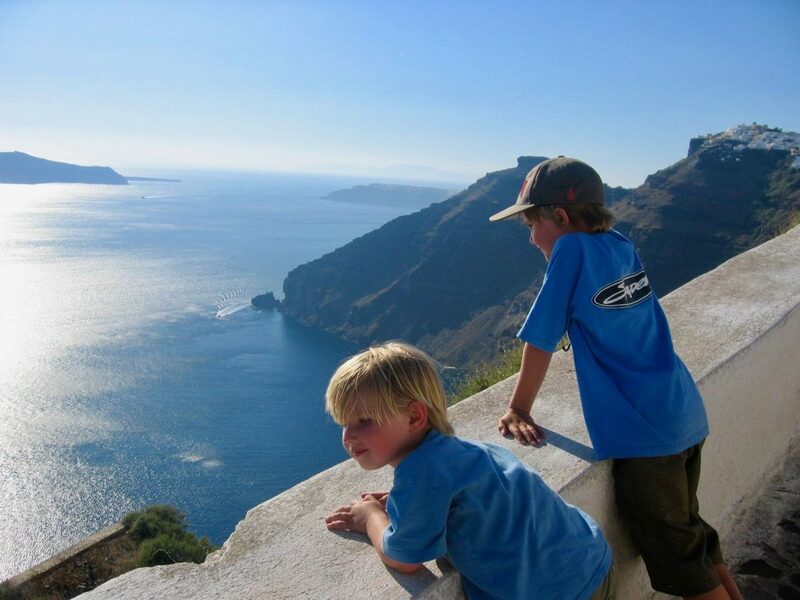 Amoudi Bay is a picturesque bay situated a short walk from Oia. 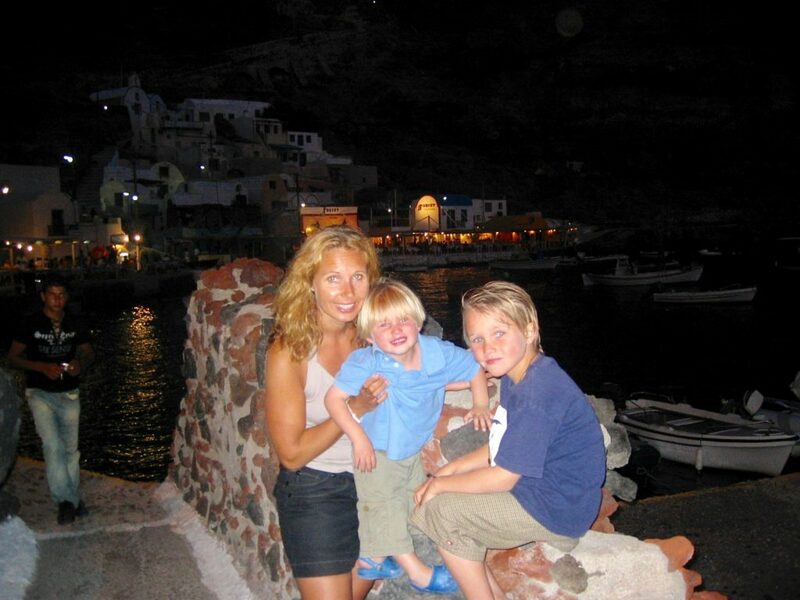 We drove to Oia, watched the incredible sunset, then walked down 1000 steps (which are fairly steep) to get to the seafood restaurants in the bay. 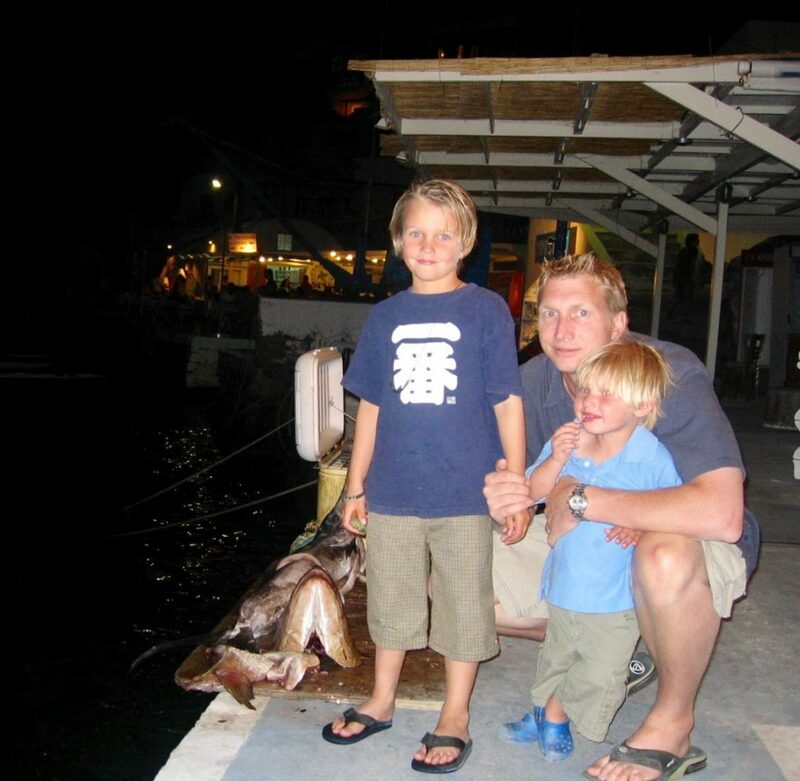 There are many restaurants and a wide variety of seafood to choose from. Dining alfresco was a special way to take in the views from the bay. 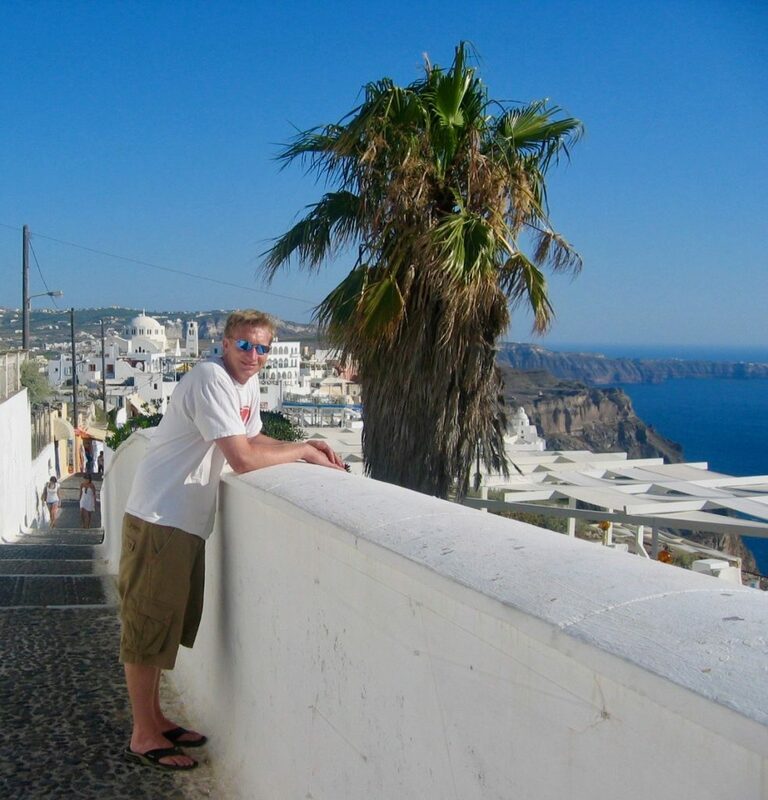 We stayed at a small boutique hotel in Fira since we wanted to experience the famous caldera views. 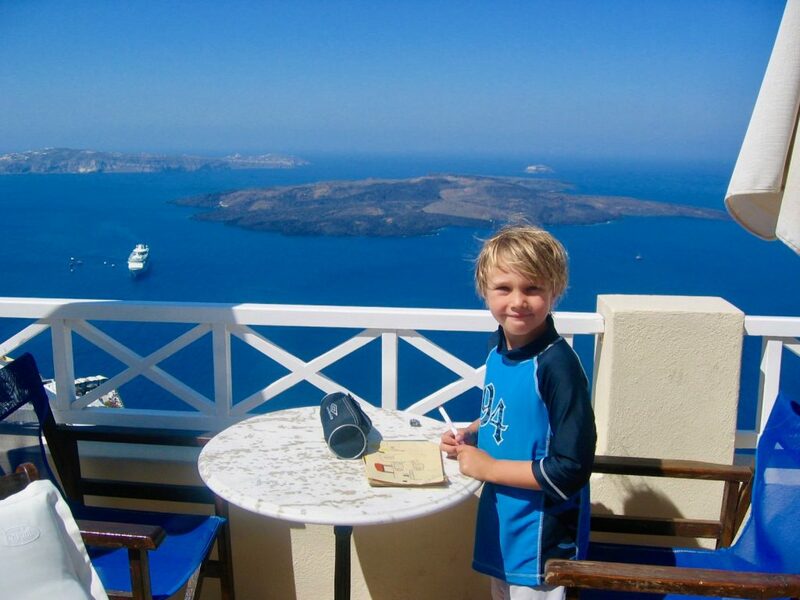 We had a stunning panoramic view of the Aegean Ocean, and eating breakfast with those views each morning was magical. Our room was a little cave built into the hillside with an individual small pool located outside our room, offering a view of the caldera. Absolutely stunning! 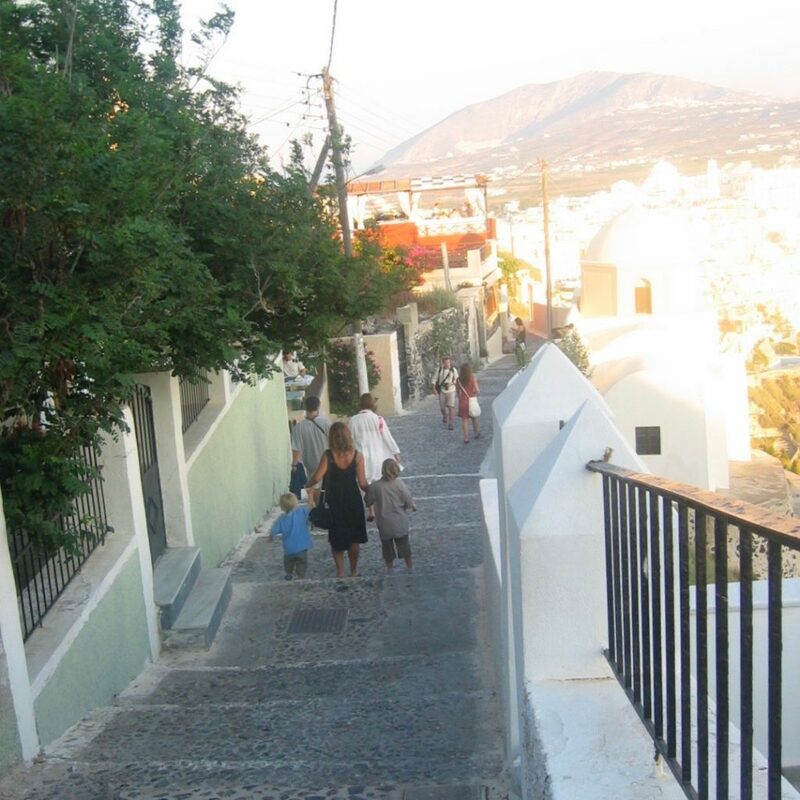 The only way to our room was down a narrow, steep set of stone stairs. You must be prepared to climb many wobbly stairs (often in the dark which can be tricky after a couple of Ouzos) if you opt for this type of accommodation. 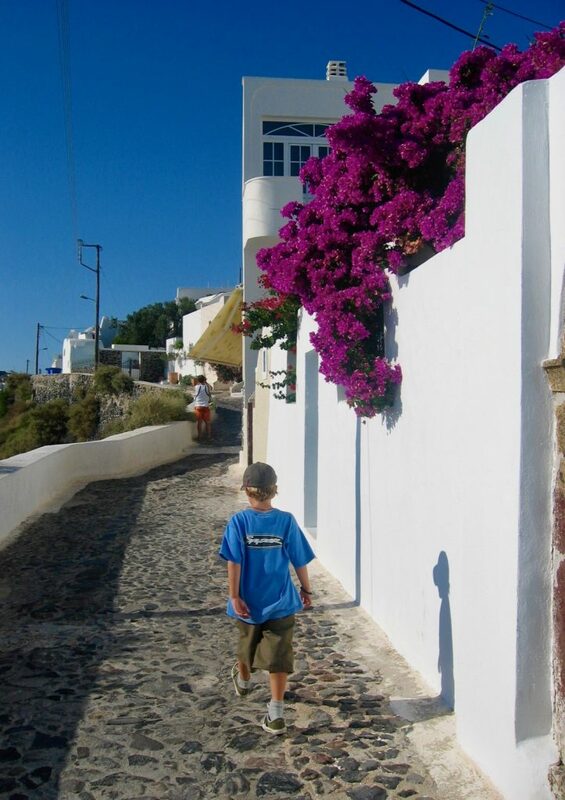 The cobbled walkways are buzzing with locals and tourists. They are pristine and I don’t think we ever saw trash on the ground. There are quaint bars and restaurants at every turn, and we spent hours wandering around the local boutiques looking for perfect souvenirs to bring home. 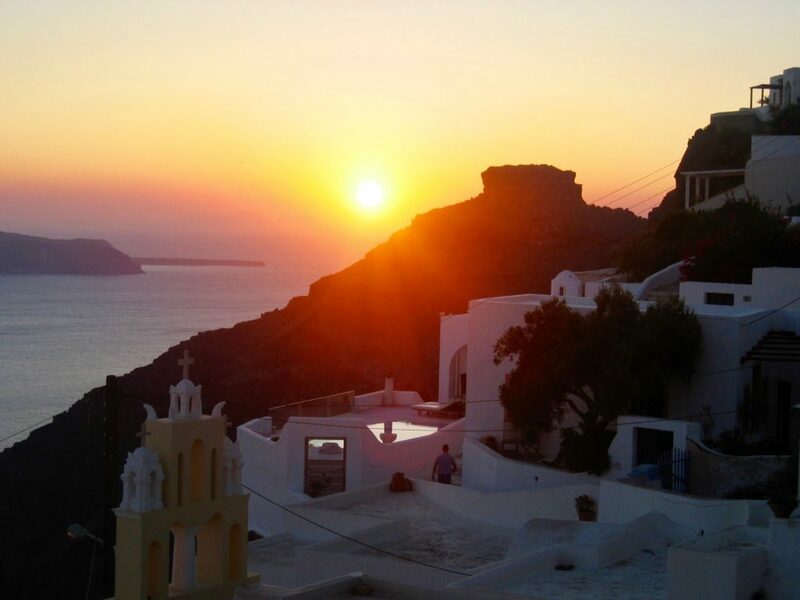 You must go to Oia to watch the sunset. It’s spectacular and on the bucket list of many travelers. The magical sunset in Oia, Santorini, Greece. 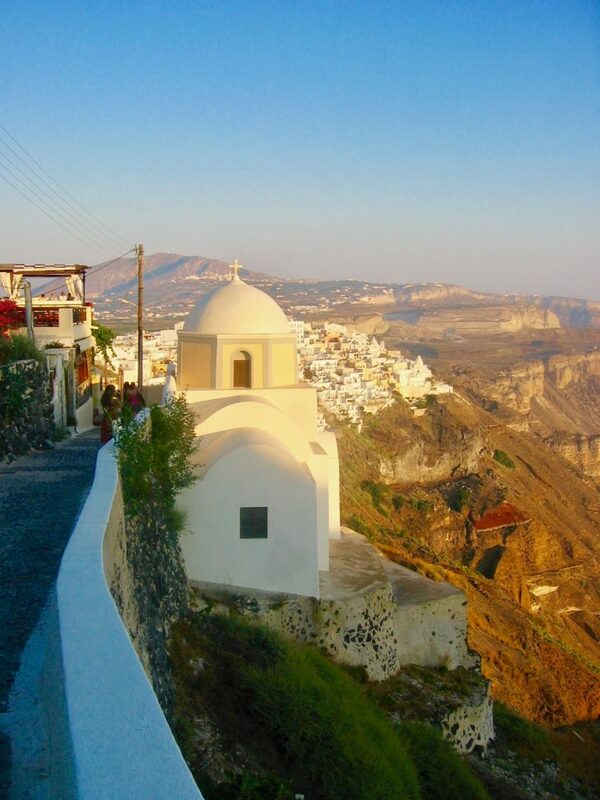 No visit to Santorini is complete without a visit to Oia to see the sunset, however you MUST go early to catch a good spot. 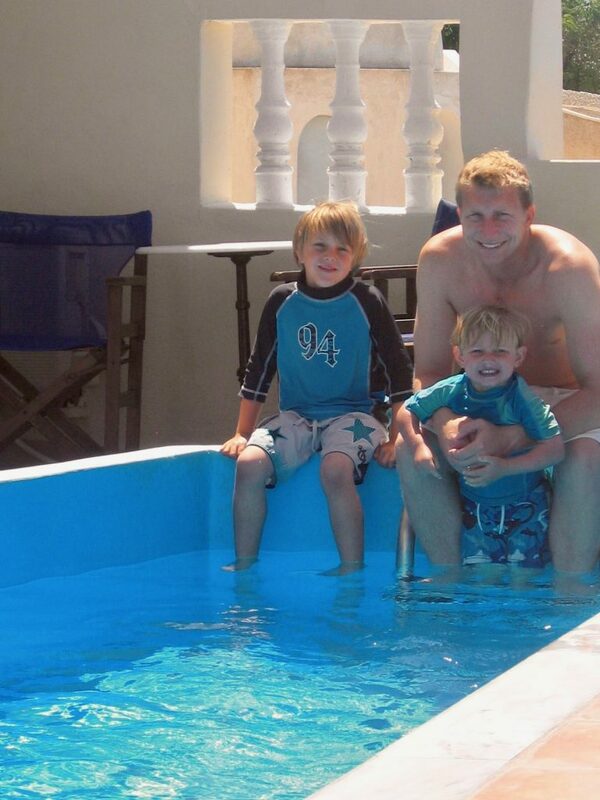 It gets unbearably crowded, and if I’m being honest, not quite as relaxing as we’d hoped for. 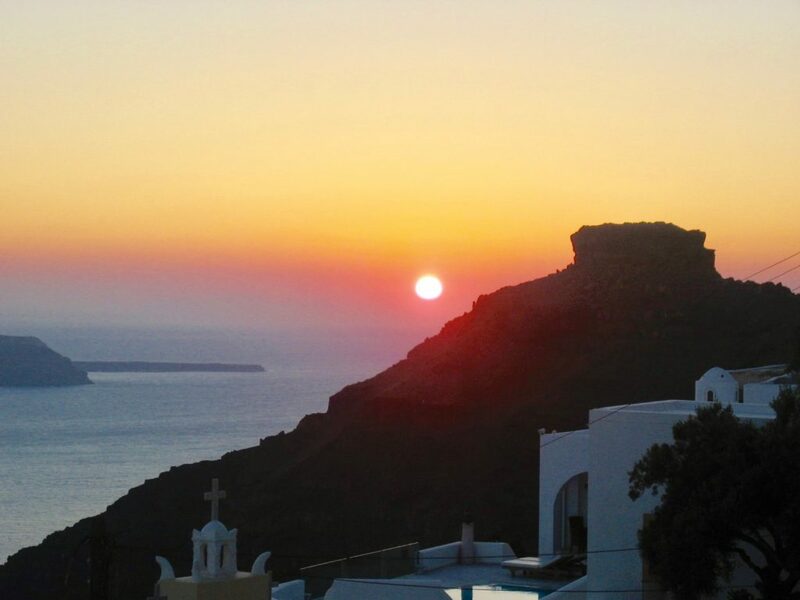 The sunset is undeniably beautiful, but there are many places on Santorini to experience the wonderful sunset in a less chaotic setting. 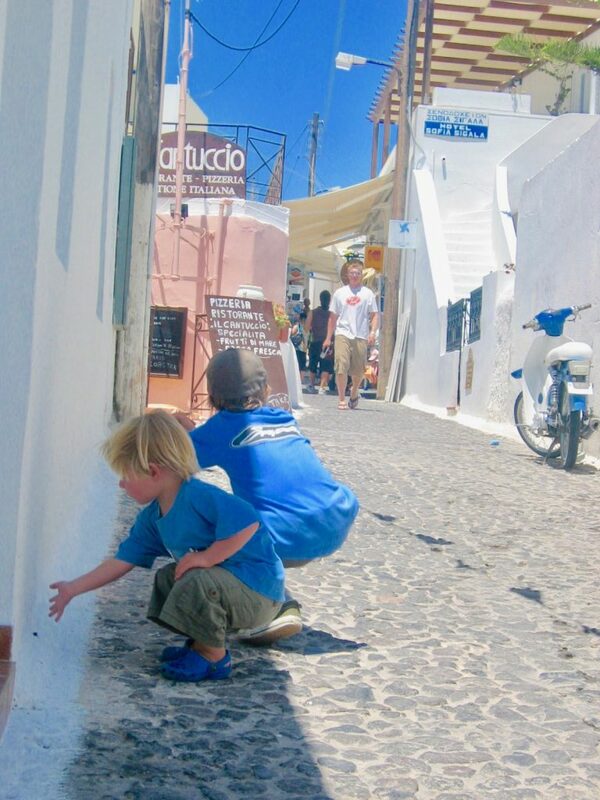 Greece is known for amazing food, and Santorini is no exception with delicious fresh local food on every corner. 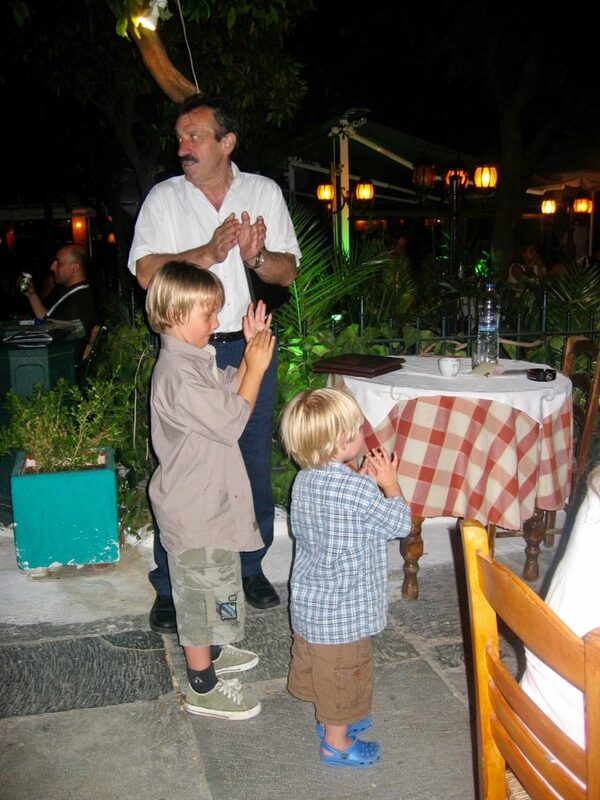 Everything is island fresh, and for breakfast each day we were served a thick strong cup of coffee and sweet and savory pastries that including traditional options like spanakopita(a spinach and feta pie) or tyropita(a cheese and egg pastry). 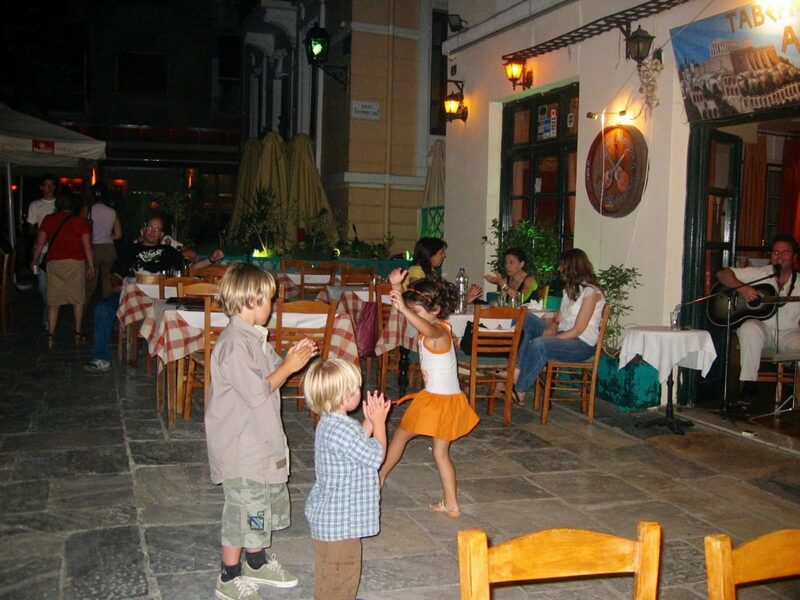 Our most memorable evenings were spent under the stars eating Moussaka, drinking Greek wine at a local bar listening to live music. 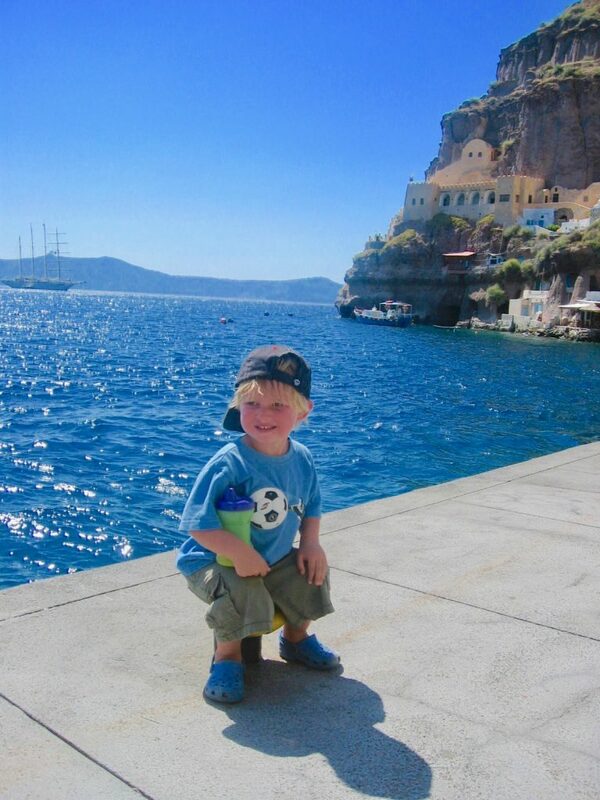 Julian (2) back when crocs were fashionable! 🙂 . 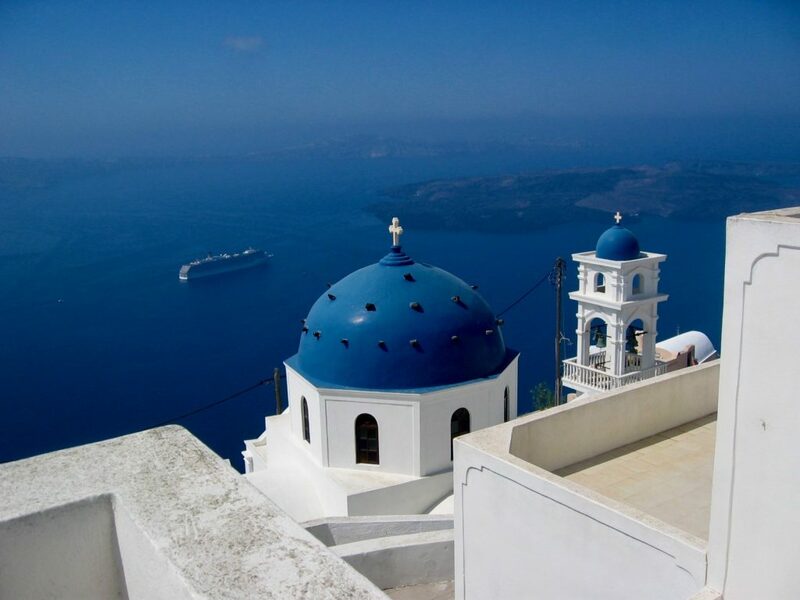 Fira is the capital of Santorini and located on the west coast. 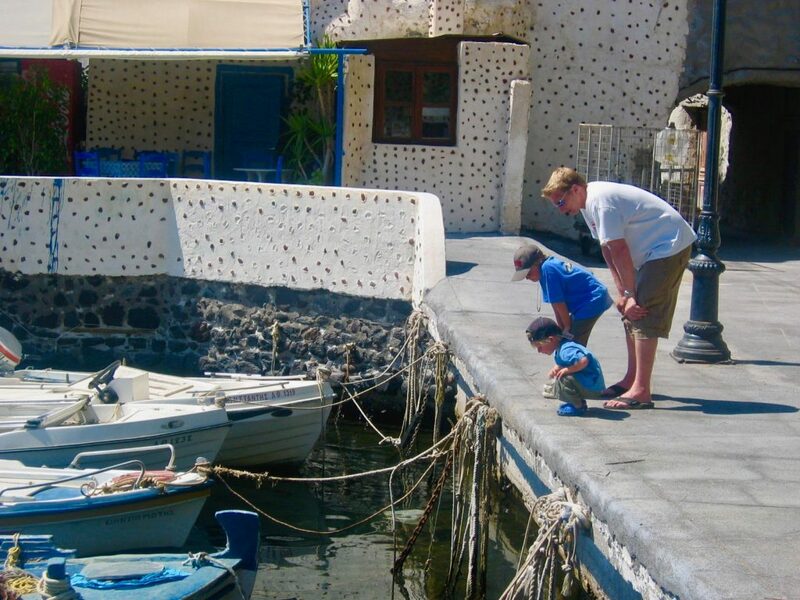 The old port of Santorini sits at the bottom of the caldera cliffs in Fira. This gorgeous harbor is filled with restaurants, wine bars and small shops. 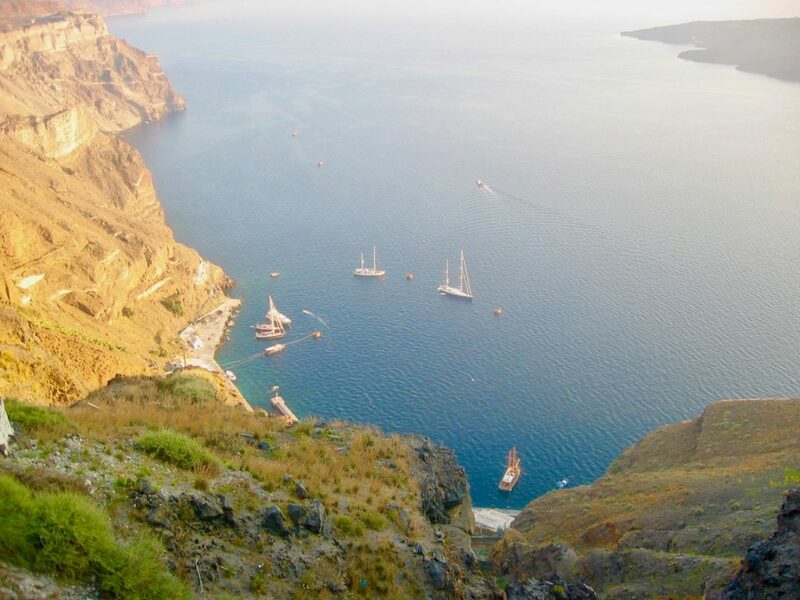 To reach the old port, you can walk down 600 stone steps, hop on a donkey, or take the cable car which leaves from the top part of the Fira caldera. 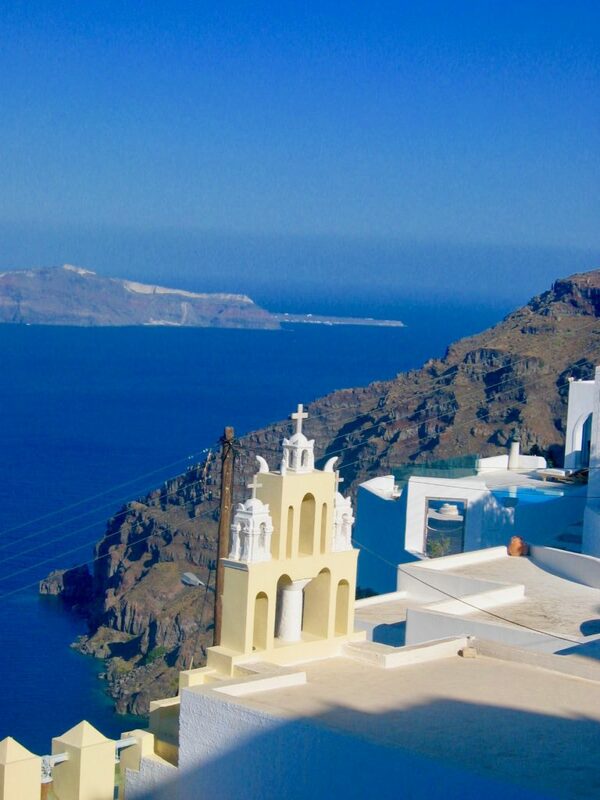 Santorini is one of the most beautiful and magical islands in the world that nobody should miss. 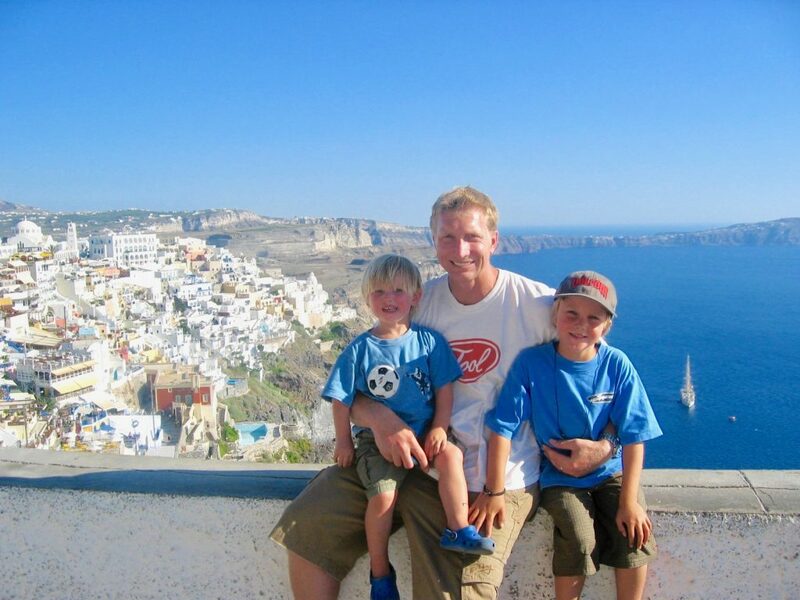 Staying at one of the local hotels perched on the edge of the cliffs is truly an experience that will be seared in your memory for years to come.